June 19, 2011 - The new mobile trainers by FACTS Training International allow crewmembers to experience in-flight fire fighting in an enclosed business aircraft cabin-like environment. The first simulator, dubbed “FACTS Fire 1”, produces smoke and live fire from three separate locations; an enclosed lavatory, a galley and cabin divan seating area. 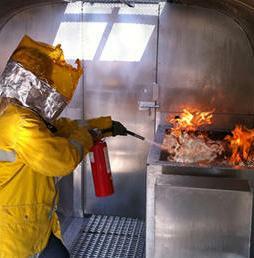 Crewmembers use smoke hoods, protective gear and fire extinguishers to combat fire in these spaces. “FACTS Training is known for its industry standard program that incorporates mobile full motion cabin simulators in order to provide a more realistic emergency procedures training experience,” said Jeffrey Roberts, CEO of AirCare Solutions Group and FACTS Training International. FACTS Training specializes in crewmember emergency procedures training for business aviation. The company’s courses combine classroom instruction with extensive hands on equipment drills to provide an elite training experience for pilots, flight attendants, maintenance technicians and flight engineers. FACTS trained crews receive instruction on land and water evacuation procedures including water ditching, in-flight and ground emergencies, in-flight medical, smoke and live fire fighting, turbulence, decompression, hypoxia awareness, crew coordination and more, using aircraft specific safety and emergency equipment. The training courses meet the requirements for FAA Part 135, JAR-OPS1, and CAR 604 emergency procedures training. The company has four fixed bases in the world including Morristown, NJ, Dallas, TX, Long Beach CA and Amsterdam, The Netherlands. FACTS’ new fire trainer is on display at this weeks’ NBAA Flight Attendant Conference in San Diego. FACTS Training International is recognized as the most experienced and respected crewmember safety, medical and emergency training institution in business aviation. All FACTS courses have unique, human factor based modules that are designed to provide pilots and flight attendants the most thorough emergency, medical, evacuation and safety programs available while using the most innovative training equipment offered in the corporate aviation industry. The AirCare Solutions specializes in medical, safety and emergency related training, services and products for business aviation. ASG companies include FACTS Emergency Procedures Training for crew members; AirCare Crews, providing a staffing solution for pilots and flight attendants, AirCare ACCESS Assistance, providing 24-7-365 tele-medical assistance and support services, and Majestic Aerotech, a part 145 repair station for medically related aerospace products. United Continental Airlines CEO Had Called Tarmac Rule Stupid Was He Right?